I followed the hamster through the corridors and some very tight maintenance shafts which ended in a dimly lit room. The room was full of hamster wheels and other toys, an automated food dispersal system and small hamster tunnels running in every direction. Even though this clearly looked like the hamster’s mess hall (or whatever you’d call this) there were not many of the little critters present. The few that had to pass from one access tunnel to another did so as fast as they could. The few that were in the room were mutilated with all kinds of random machine parts attached to them. Suddenly the robot turned it’s head slowly to face me. “What?” I asked, a bit confused. I heard a tiny squeak of victory and looked at the source of the sound; there was George, sitting on the robot’s shoulder having gnawed through some exposed wiring. I knew this would only temporarily disable a robot of this mark, backup power sources could come back online within 30 minutes. “I can’t possibly drag this thing all the way back before it reboots…” I mumbled. 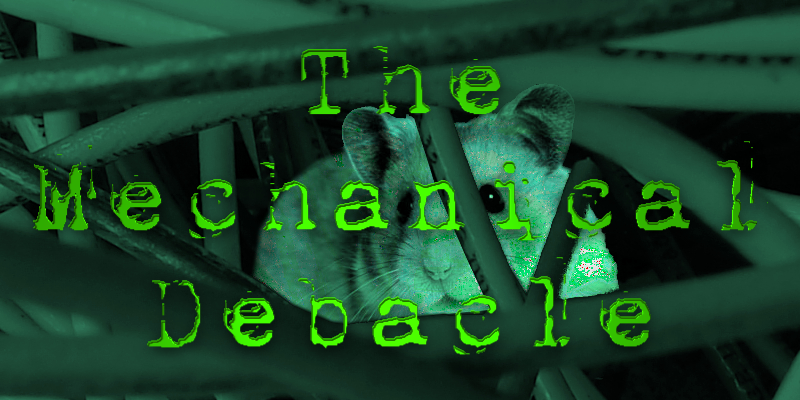 Within a few seconds I heard scurrying coming out of all the walls, and an army of hamsters came from all corners of the bunker, the lights started to dim and flicker a bit. I guess they left only the essential workforce to deal with the generators and other critical bunker functionalities. It took a few minutes to fold in the robot a bit so it would fit through the maintenance shafts. The hamsters did the rest and manouvered the robot back to the main corridors, I just had to crawl after them to the exit. “Let’s get it to the robotics lab.” I said and after some squeaks they started moving. I walked along, checking the robot’s registration and credentials on my handheld terminal. We arrived at the robotics lab, and I restrained the robot in one of the empty alcoves. I put the robot in debug mode by placing some jumpers on it’s mainboard. Once it booted in debug mode I plugged in the debugging cables, and started downloading it’s operating system and stored data. I closed the alcove for the download to process, I’ll check again in the morning. Next Next post: Toy Soldier of the Week: Engineer RAD! !